England’s holiday boating heartland can be found in East Anglia where the Broads’ labyrinthine waterways are a rich source of natural beauty and exploratory adventures. Norfolk is a somewhat overlooked corner of Britain. Its countryside doesn’t get the adoration lavished on, say, Cornwall, Devon or Gloucestershire because it doesn’t have the immediate easy charm of quintessential rolling rural England. To the unfamiliar its sweeping expanses and vast skies it can make it appear a rather bleak and uninviting place, and even prompt unfair dismissals that it is just too flat and boring. In reality Norfolk is as enchanting as anywhere else in Britain but to truly experience its melancholy wonders you have to venture into the rural heartland that is the Broads, with its woodland, fens, grazing marshes, rare plants and wildlife and, of course, the shallow lakes that provide its name. As boating is at the core of the history and culture of this wetland kingdom, the only way to see it is from a boat. The broads themselves are shallow lakes that formed in medieval times when areas of peat dug up for fuel were later flooded by rising water levels. There are over 40 and are largely linked together by rivers and channels to form a labyrinth of over 125 miles of waterways to explore, creating a paradise for boaters. The area has been recognised as a mecca for all manner of boaters since the late 19th century when yachts were first hired out there. Up until the 1950s, the waterways were also heavily used for ferrying goods between local villages and towns. In fact the active boating culture is one of the few changes the Broads has experienced since it first emerged in the 14th century. It remains a quiet and unspoilt wild wetland of reedbeds, rivers and grazing meadows. To explore the area, boaters navigate down one or more of the six main rivers in the north's Ant, Bure and Thurne, and the south's Yare, Chet and Waveney, which all become one at Breydon Water, before entering the North Sea. 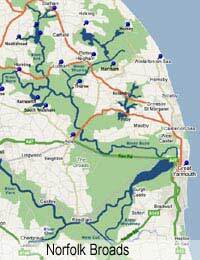 Each of the Broadland rivers has its own character and attractive settlements on route. The charming and historic village of Coltishall marks the beginning of the Bure, a river typified by wooden banks in its upper reaches before the surroundings open out into beautiful fenlands fringed with reeds and grassy meadows. The river also passes through the bustling boating magnet of Hoveton & Wroxham and the popular village of Ranworth, with its famous church referred to as the ‘Cathedral of the Broads’. The Bure’s broads include the 120-acre Wroxham Broad, the sandy shored Salhouse Broad and the non-navigable nature reserve that is the Hoveton Great Broad. Its tributary, the River Ant, is a particularly narrow and shallow stretch that winds through some of the Broads’ more remote corners as well as the villages of How Hill, Sutton and Neatishead, and the bustling market town of Stalham. Sights worth looking out for in these settlements include the Neatishead's Georgian houses, Sutton Mill’s tall windmill and Stalham’s Broads museum. The Ant’s main broad is Barton Broad, one of Norfolk’s largest. Extraordinary flat and open expanses, where treeless meadows are dotted with occasional windmills, characterise the River Thurne, another tributary of the Bure. This waterway also passes by the attractive village of Ludham, the birdspotter’s treasure that is Horsey Mere, and also through the 500 acre Hickling Broad, the largest broad and a popular spot for windsurfers. Before the winding River Waveney joins the River Yare it flows for 35km alongside the border between Norfolk and Suffolk and along past the charming Broads town of Beccles - with its lovely quay - Burgh Castle, the 13th century St Olaves Priory and lively hub of Oulton Broad. Another Yare tributary is the small River Chet, a waterway that becomes navigable once it reaches Loddon Staithe and which then goes on to pass through the nature reserve of Hardley Flood. The River Yare itself flows from the ancient city of Norwich and its passage is characterised firstly by hilly and wooded banks before it opens out into open fens and marshland. Settlements on route include the busy holiday village of Brundall, historic port of Reedham and the pretty Bramerton, before the journey ends by the sands of Great Yarmouth.